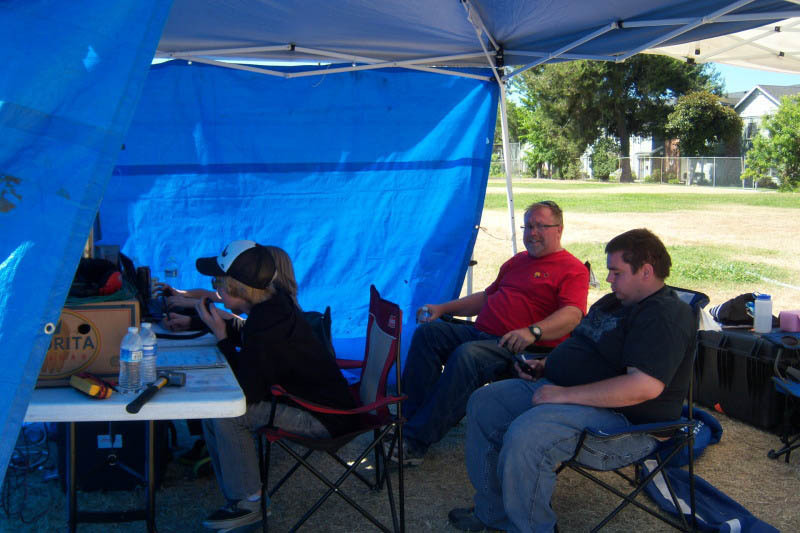 The GOTA station this year was organized and coached by Brett W6BAC, the Scout Master of BSA Troop 788 (seated in red shirt). 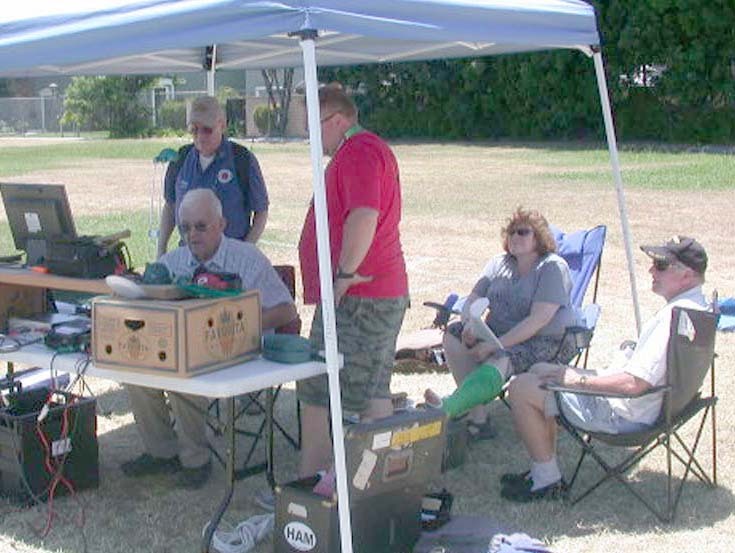 The GOTA station purpose is to introduce new comers to try their hand at ham radio and at a contest. In addition, the scouts were earning a Merit Badge for radio. 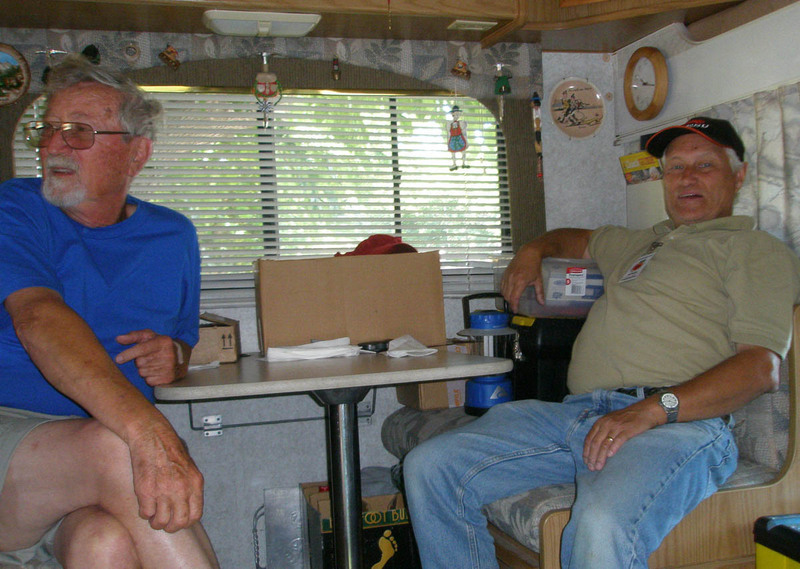 Frank W6NKU sits down at the GOTA station to sort out some small problems with the antenna tuner for the trapped dipole antenna and the antenna analyzer. Standing in the red shirt is Scout Master Brett W6BAC. This photo shows ??? 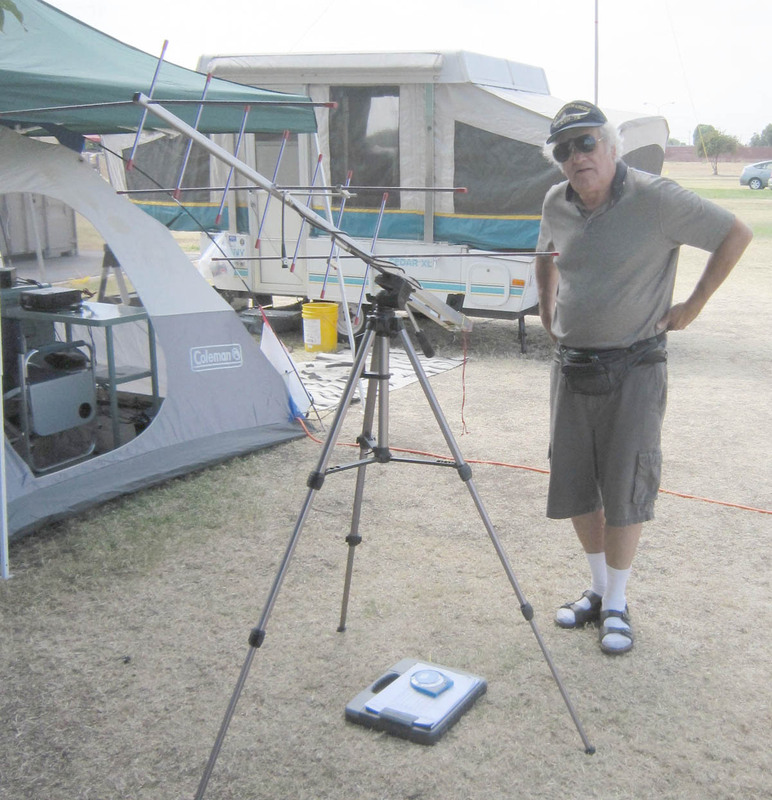 standing next to the satellite antenna that was used at Field Day. 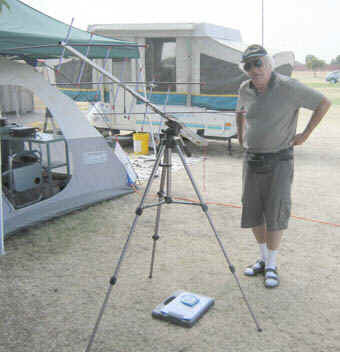 There were no satellite contacts reported. Bummer!! 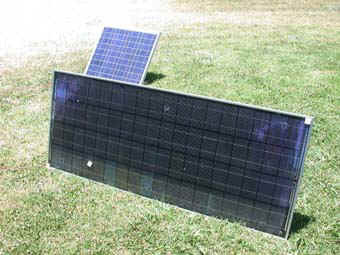 Nicholas AF6CF volunteered to set-up his solar power system at FD. The panels shown here powered the VHF/UHF stations during the entire Field Day period. 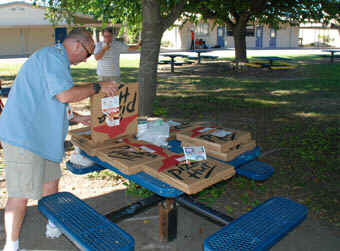 The dinner for Saturday evening was many varieties of Pizza. Doug W6FKX is seen here grabbing a few pieces to chow down. 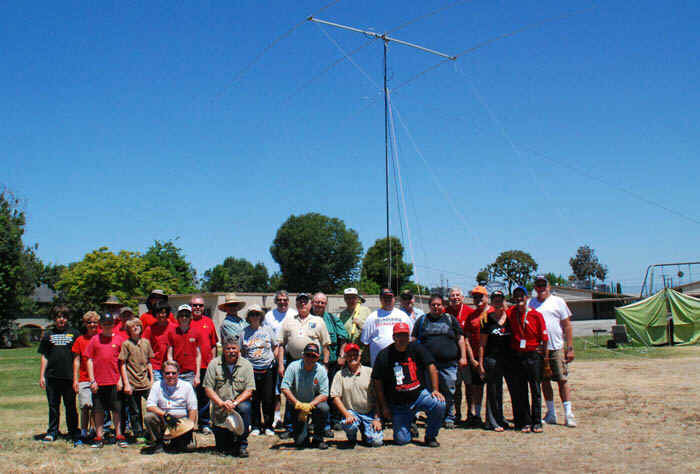 This year, ARRL added extra bonus points for conducting an "educational event" during FD. 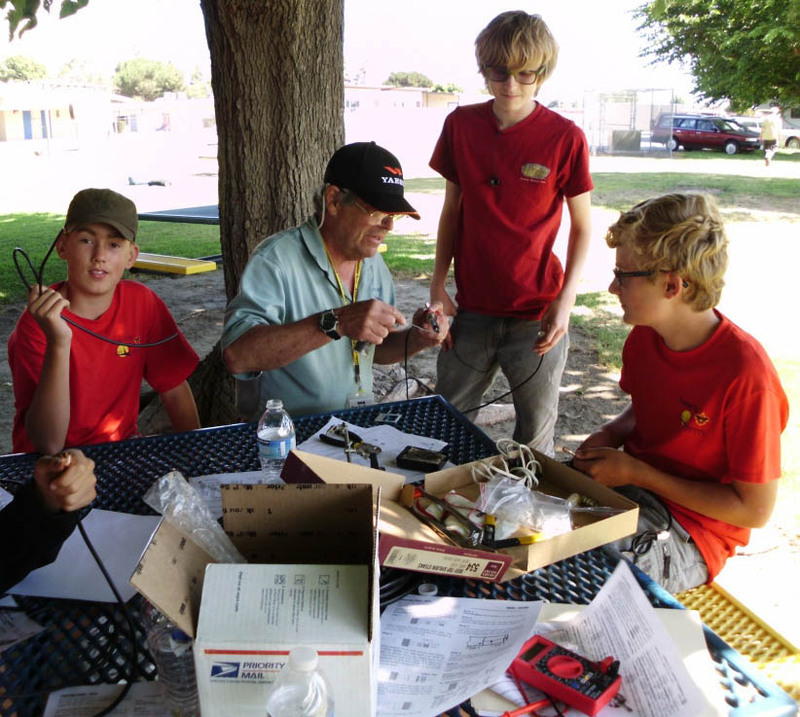 Bob AF6C organized a class for soldering coax cables that was attended by both Boy Scouts and OCARC members. 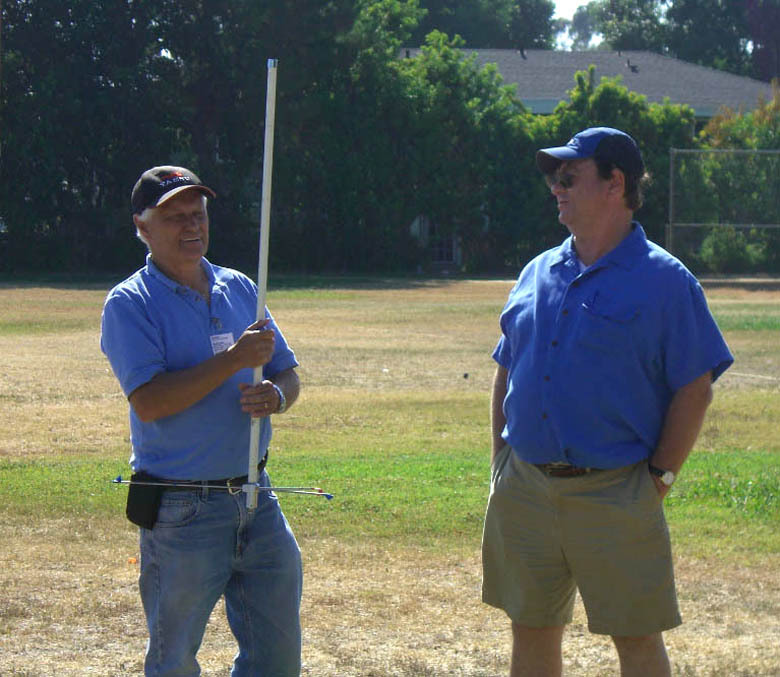 The photographer of this photo (Paul W6GMU) reported that Nicholas AF6CF (on left) was explaining that he was holding a "florescent bulb" and that it would soon light up from the nearby RF. 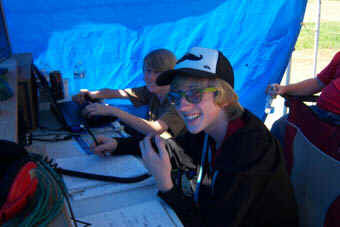 Field Day is not "all work". If enough club members participate, then there is always enough time to rest and chat during FD. Here Nicholas AF6CF (on right) rests in the shady motorhome of his friend Bruno (no call). 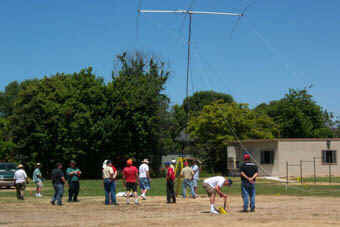 The tear-down crew is seen here "swarming" around the 20M PHN tower to lower it to the ground after FD. The military stacking-masts tower was lowered by removing one 5-foot section at a time.